In a large mixing bowl, mix the flours, salt and yeast. Add the oil and 325ml warm water and mix to a rough dough. 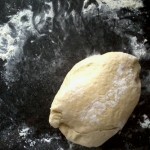 Flour your work surface and hands and knead the dough rhythmically for about 10 minutes. Put the dough in a lightly oiled bowl, cover with a tea towel and leave in a warm place for at least an hour. The dough should double in size. Never fail pizza 5 out of 5 based on 5 ratings. Legendary pizzas Beth!!! You can’t buy these in the shops!